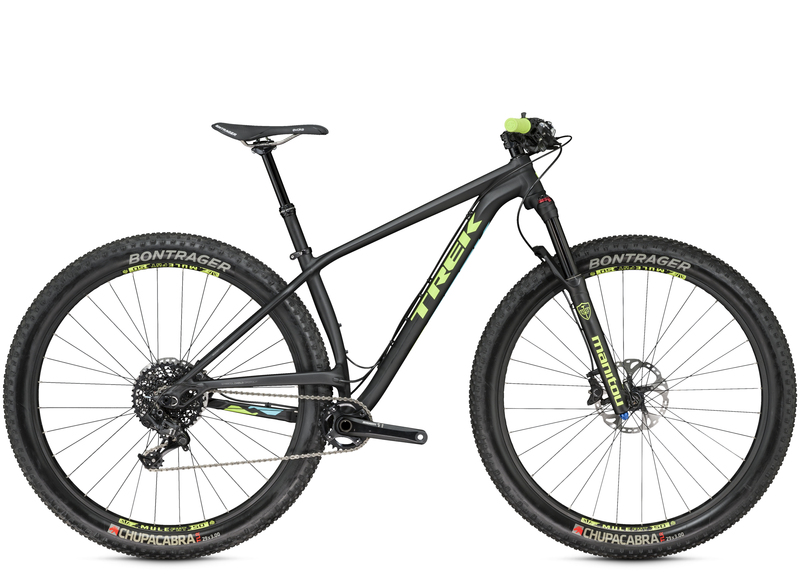 Launched in the UK a couple of years ago, the Trek Stache has been given a complete makeover and redesign. 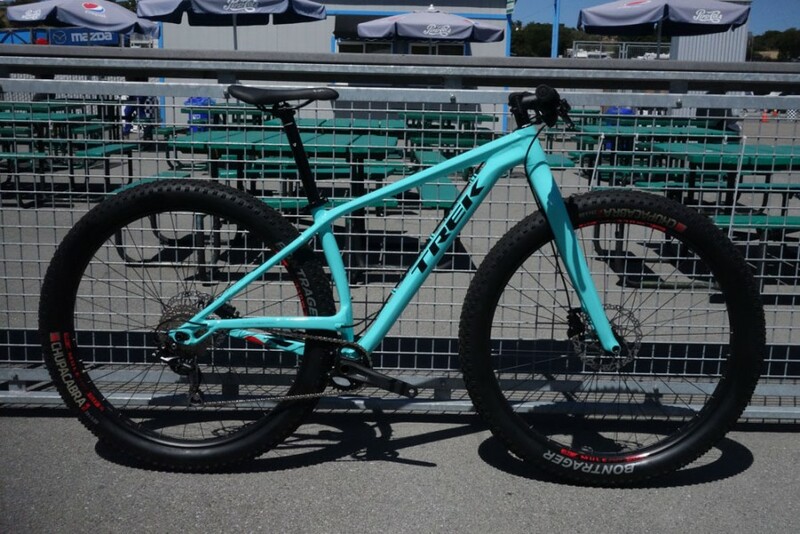 It’s the first of many bikes we’ve been shown so far at this year’s Sea Otter that have taken the ‘plus size’ chubby, semi-fat wheel size thing and run with it. The beautiful Stache 5, that unfortunately you can’t get in the UK. 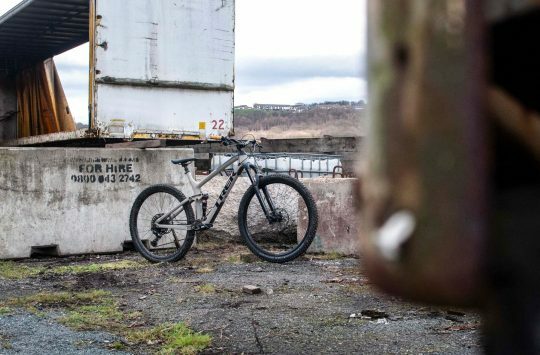 The Stache was originally launched as Trek’s ‘have fun hardtail’ kind of a bike – and the product managers admit that they’d studied the UK’s love of trail hardtails when putting the first design together. However, now, with the some 29+ wheels, there’s a lot more room for the fun element. Who’d have thought that the E-stay would return, eh? 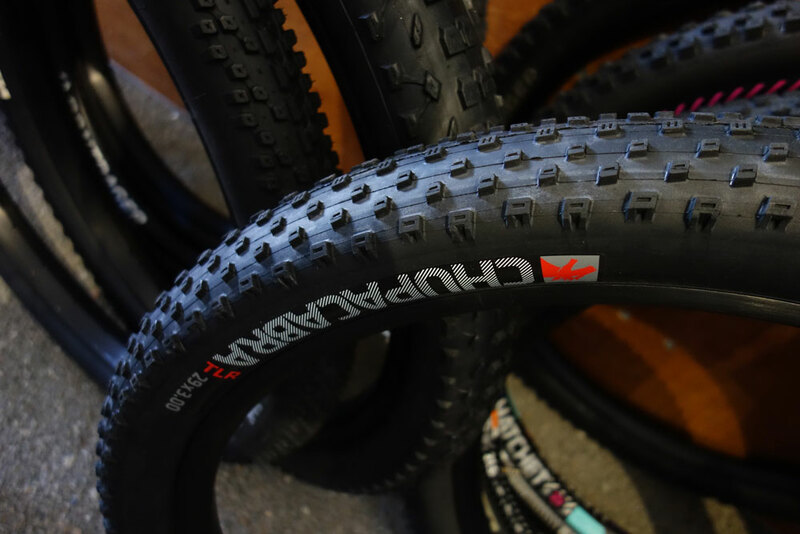 The Stache is designed for 29in x 3in tyres on 50mm rims (and there’s a new Bontrager tyre, the Chupacabra, out to fill that role) although some clever dropout design means that the bike will also take regular 29in wheels, as well as the new 27.5in x 3in size. 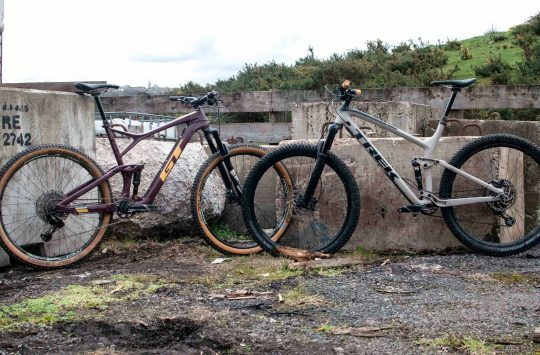 The bike runs Boost 148mm rear end and a Manitou Boost fork too. I don’t get it. 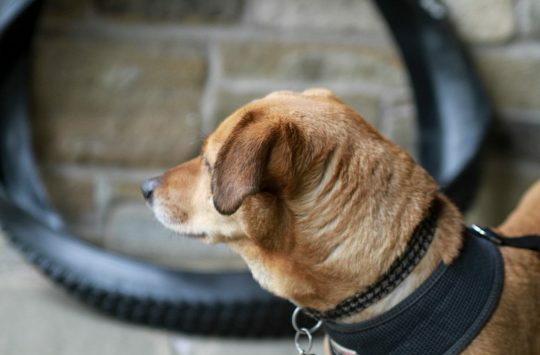 Who is this bike for? 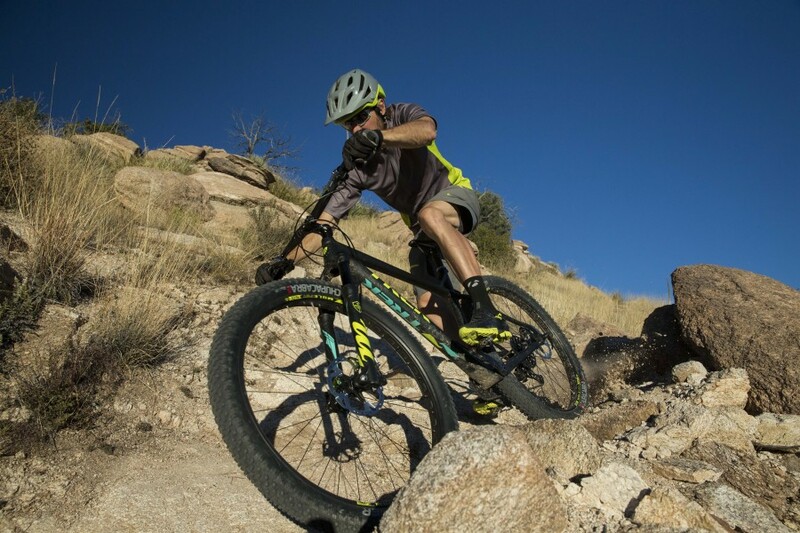 Stache is a trail hardtail for someone who wants the capability of a full suspension trail bike with the simplicity and efficiency of a hardtail. What’s with the elevated chainstay? 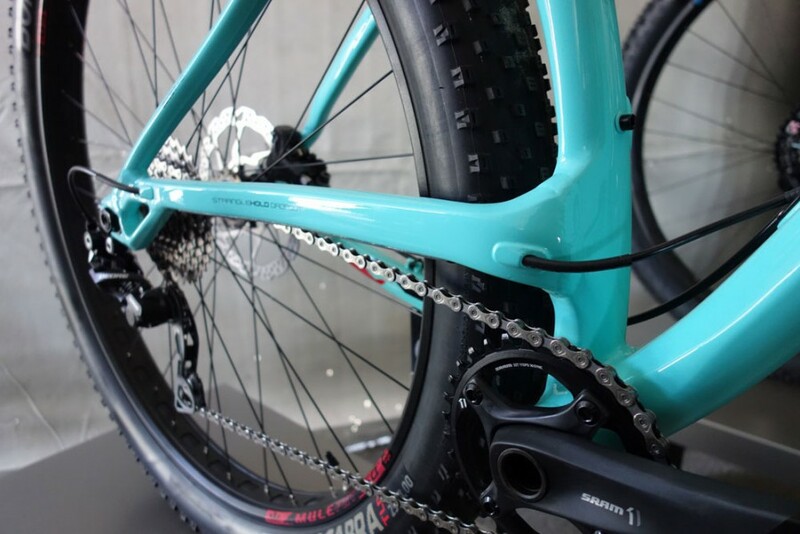 The elevated “midstay” on the drive-side of the bike gets the chainstay out of the way of the crank and rear tire to allow both tire clearance and short chainstays. 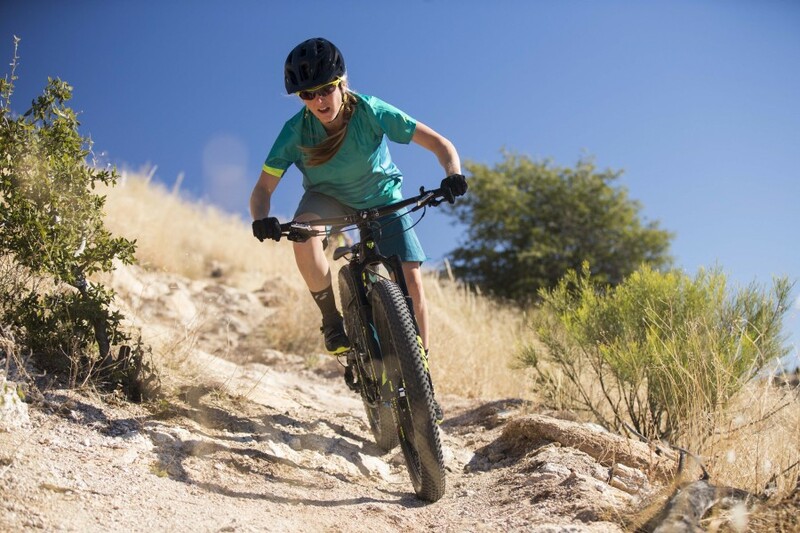 Wider tires provide greater control along while incredibly short and stiff chainstays improve handling and maneuverability. With several different models; rigid to front suspension (featuring Manitou’s special new Magnum ‘plus’ fork), there are many options. 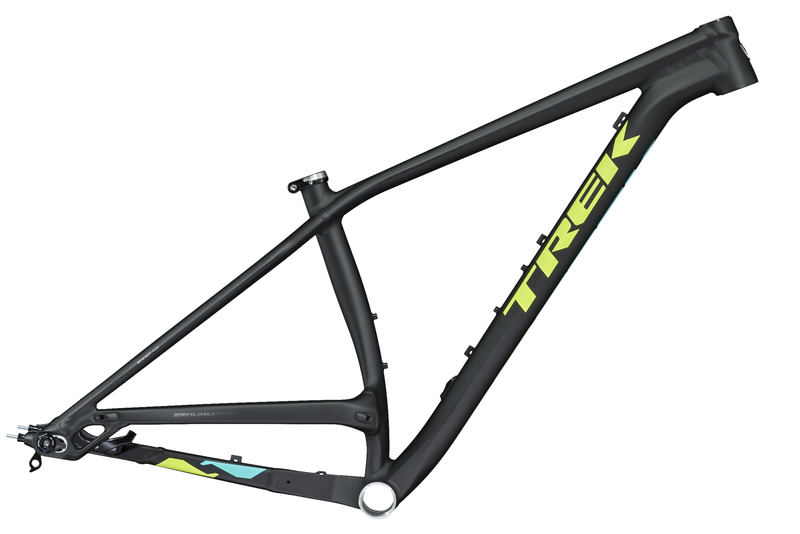 Key to all the frames, though, is the elevated chainstay, a hark back to Gary Fisher’s Montare frame, with a short 405-420mm chainstay length. Down at the dropout, the new Stranglehold dropout allows for 15mm fore-aft movement and singlespeed capability. The Stache is the first bike to feature both Boost148 and Boost110. The Stache 9 and 7 have 110mm front hub spacing on the Manitou fork. The Stache 5 features a rigid carbon fork with 100mm spacing. All Stache models feature Boost 148 in the rear. The Stache 5 is unfortunately only available in the USA, but the Stache 9 is available now. Stache 7 will be available in June with a brand new SRAM 1x drivetrain. It’ll also come as a frame-only. They do look like fun and I’d be curious to have a go on one. Can’t see one finding a place in my shed though. Boost is fine. Things change. Life goes on. That blue version looks sweet. Is that aluminium or carbon? Either way, I like it. Less niche, more mainstream = more affordable. This is where Boost makes the most sense. Wider chain line gives the chain clearance around the big rear tyre without forcing a John Wayne stance. 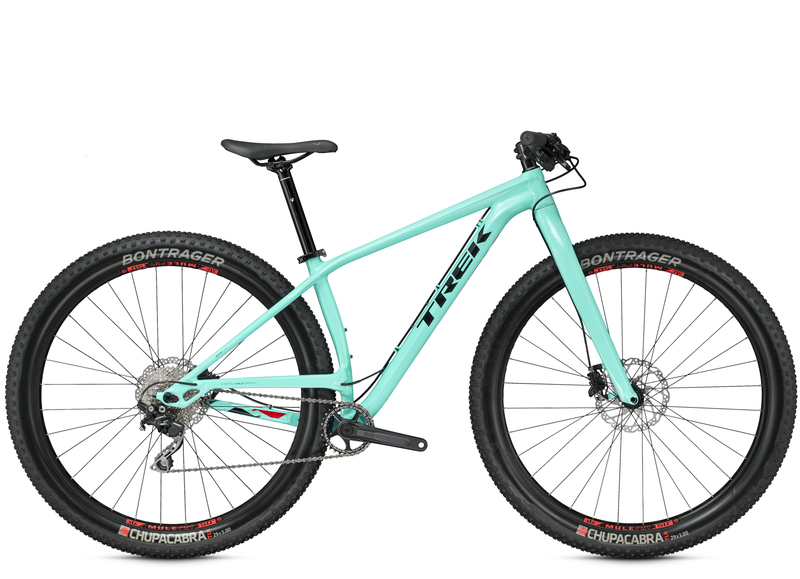 I like that… and belt drive would be an option with the elevated stay. that rigid in bluey greeny colour looks epic. want. Elevated stay love it please can we have the old alpinestars almega back but in carbon. Well they’re one future, and one I’ve happily been living in for 2 years with my Krampus 🙂 that said, bring on more (and cheaper) tyre options!